If I was to write a list of my top 10 favourite things in the world, on it would be probably be my children (of which there are 3) and 7 types of bread. And when it comes to making your own bread, there is something completely wholesomely wonderful about it. It makes me feel like the real deal. I started making my own bread about 6 months ago, but you can be sure that over those 6 months I have made some pretty bad bread. Particularly in my endeavour to try to produce gluten-free options, my mum could tell you about the buckwheat loaf/rock I made, and then there was the coconut flour flat-bread which no-one can tell you about, as it was so bad, I had to prematurely put an end to it. Unfortunately I haven’t yet had any success with the gluten-free options, but I do believe I have mastered the not-gluten-free bread recipe. As previously mentioned I like to try to keep these processes as short as possible, and one of the most genius inventions of late is the bread-making machine. However, in my opinion, they should stop making bread-making machines and just make dough-making machines, as bread cooked in the oven, is really much better than bread cooked in the bread-making machine. For the record, I had read this on many occasions but chose to ignore it as I thought it would be too time consuming to bake it in the oven, however one day I was feeling adventurous and decided to put it to the test. Turns out it’s true, in fact, oven baked bread even smells better. As it happens, doing the cooking part in the oven doesn’t take much extra work. And I don’t actually do all that much during any of this bread making process, as my former-bread-making-machine (but now only dough-making-machine) does all the hard work at the start, and then the oven takes over at the end. I just get to take the glory. I managed to pick up my dough-making-machine from the Green Shed in Mitchell, which for those of you don’t know, is a fantastic recycling facility at the Canberra rubbish dump. They salvage people’s “rubbish” and sell it to people like me, I have found the most amazing stuff out there and they sell it dirt cheap. All their electrical stuff is tested and tagged for safety and you can test it out at the power point on the counter before you buy it to make sure it works (ok, well make sure it turns on anyway, as you probably don’t want to hang around for the full 5 hours or so that it would take to make a loaf of bread). My bread-making machine cost me $10, and it seems plenty of people are throwing these machines away, as I see them every time I go to the Green shed. 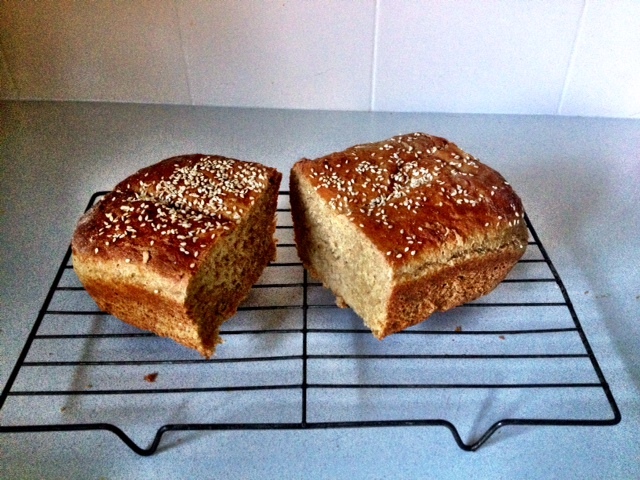 But back to the bread making……. one other thing you need to make sure of is that you use decent flour. The first few terrible loaves I made were especially terrible because I just grabbed your basic, supermarket-bought wholemeal flour, not a good idea. I have since sourced some lovely organic, wholemeal bakers flour (for those in Canberra, they sell it at the Organic Food co-op, and it is dirt cheap at around $3.80 a kilo, you will get about 2.5 loaves out of that), and it makes lovely bread. Here is how I manage to get delicious 100% whole-grain bread, this recipe is adapted from the Dove’s farm Traditional Wholemeal Bread Recipe. Now you will actually need some time for this, it takes about 2.5 – 3 hours to make, but don’t let that put you off, the whole process is really simple, and as I mentioned, you aren’t actually even doing much, its more just a case of being around to keep your eye on things. So you can be doing other things at the same time. Put all the ingredients into the dough-making machine (apparently not all bread machines are created equal, and depending on the brand, it depends on what order you put the ingredients in, mine requires the liquids first), set it to the “dough” setting and let it do it’s thing. Mine spends 30 minutes kneading the dough (do real DIY people actually knead dough for a full half hour?! ), and then 1 hour rising it. Once the machine is finished, turn your oven onto the lowest possible setting, and then you will need to flour your kitchen bench so that you can roll your dough out of the bread machine tin onto it. You then need to give the dough a few good punches. (When I first changed from baking the bread in the bread machine, to baking it in the oven, I skipped this step as I thought it was fairly counter-productive, and a big waste of time. Why would you have your bread rise beautifully in the bread machine for an hour and then punch it back down to a ball of dough? However, after only partially enjoying a number of really dense loaves, I finally read to the end of a recipe and found that this step helps the bread to become softer and fluffier, and it definitely does). After you have punched it all the air out of it, gather it up and put it into a loaf tin ( I have seen plenty of complicated explanations on the “right” way to do this, but I manage to get a decent looking loaf each time from just chucking it into the pan), and then put it into your oven, which you have turned on to the lowest heat. You then leave the bread in there, with the door closed to rise all over again, this time it takes around 40 minutes, but you can just keep checking on it, you will know when it looks like it has risen enough. Once it is at it’s full size, turn the oven up to around 200° celsius (for a fan forced or a bit hotter if not fan forced), and bake for around 15 – 20 minutes. I find that the smell of the bread becomes really strong when it is ready, the top of the bread should be light brown, and the loaf should sound hollow when you tap it. Let the loaf cool in the pan for 5 minutes or so and then transfer to a cooling rack, or just eat the whole loaf right there and then, as this is when it is at it’s best. As there are no preservatives, this bread is at it’s best the first 2 days after baking, and after that it makes delicious toast. You can, of course, also store it in the freezer. I call this the “basic” recipe as the possibilities of what you can add to this are endless, you can add in all kinds of seeds and grains, or mix-up the flour with rye, or spelt or whatever. One of my favourites (and the picture above) is to add 2 cloves of garlic and a few sprigs of rosemary and then sprinkle some sesame seeds on top. Delicious. I am still on the hunt for a fool-proof, delicious gluten-free recipe – do you have one you can share? 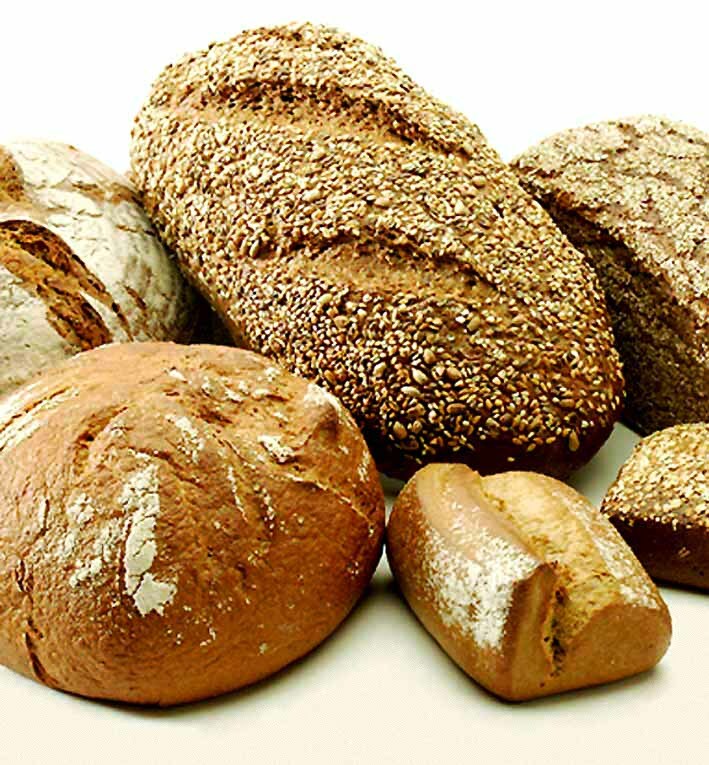 Categories: Food, Recipes | Tags: 100% wholegrain bread recipe, bread recipe, Homemade bread recipe, make it from scratch, simple homemade bread recipe | Permalink.